Jamie may consider himself a failure as a father, but his parting gift to his daughter is what she needed: a way to find peace. Unfortunately, the way she decides to obtain that peace is anything but calming for John. She needs to confront Bonnet in person. On the face of it, the scene between Brianna and Stephen Bonnet was simply about her forgiving him, but I think it was more. I think it was about Brianna facing her fear. She said what she needed to say to Bonnet, and kept her head high as she did it, but I don’t think she truly conquered her fear until he pissed her off. The strength and maturity that Brianna has developed over the last few episodes has made her one of my favorite characters on the show. Unfortunately, I can’t say the same about Roger. A sizable part of the episode was set in the Mohawk village. The episode opened with Roger being jumped (sorry, that gang analogy is just really strong in my mind) into the Mohawk community. Unfortunately, he fails. (I think his error was not getting back on his feet after receiving the shoulder wound.) Roger remains officially a captive. I wonder if part of Roger’s difficulty was his unwillingness to try and learn about their customs or even the layout of the village. Roger makes no effort to learn the language. Even a captive working on an escape plan can only benefit from convincing his captors that he’s trying to be a good boy. Johiehon offers him something to sooth the pain in his shoulder. Instead of trying to make a friend who might eventually help him escape or just make his time here less miserable. He immediately asks her to help him escape. She of course says 'no'. When Kaheroton asks Roger why his own people sold them it was an opportunity for him to correct an impression, attempt connect or improve how he’s treated. If he had mentioned that he was attacked while on the way to see his wife, he might have garnered a bit of compassion. Not to mention convince Kaheroton he wasn’t a rival. I feel like I’m on a roller coaster with Roger. Every time I begin to connect with his character, he does something that makes me want to write him off. I never reconnected with the character after the way he treated Brianna the last time they saw each other in the 20th Century. The handfasting was a sweet sequence, but he never apologized for his behavior when he first proposed, consequently I’ve never gotten back on his side. I had as much patience and sympathy for Roger as he had for Father Ferigault. Father Ferigault’s story felt like wasted screen time. I recognize that Roger’s conversations with Ferigault were intended to give us insight into Roger’s emotional state at this point, but for me, he was feeling sorry for himself and doing nothing to help himself. Where Brianna’s trials and tribulations led to her maturing, Roger doesn’t seem close to that. Roger managed to escape, again, but returns to spare Ferigault a slow painful death. Roger ends up being returned to the ‘idiot hut’. The expression on Kaheroton’s face as he picked up the baby was another moment that forced me to re-evaluate his character. He ended up being a more sympathetic character in this episode than Roger. Marsali just grows on me more with each episode. When she discovers her husband working on an escape plan, she takes a panicked deep breath then commits 100% to helping Fergus free Murtagh. 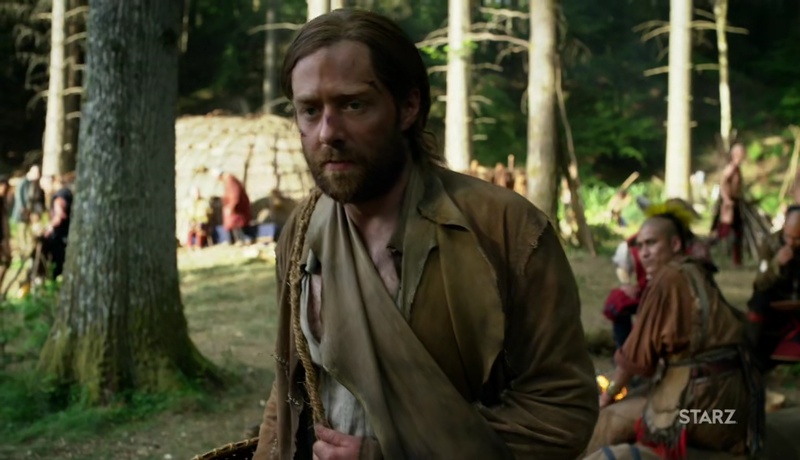 They wisely decide that, once they’ve freed Murtagh, it might be best to move to Fraser’s Ridge. Watching the Regulators gather to put their plan into action (was that not least inconspicuous group of people ever? ), I was convinced the plan would not work. 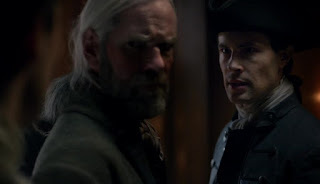 But the plan went off without a hitch, as long as you don’t consider Murtagh and Lord John standing around arguing over Brianna instead of running a hitch. One thing I did find really interesting about this sequence was having the opportunity to learn something about this culture. Allowing us to understand what the Mohawk were saying to each other gave us some insight on why they were so angry with Roger. I knew it was rude to talk over someone else, but pointing? 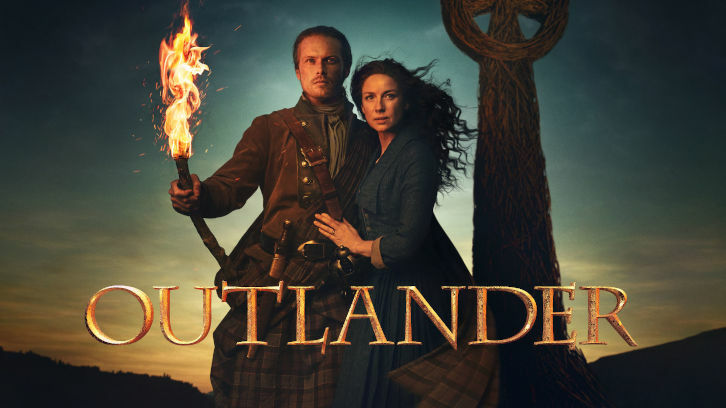 The show is moving from a major focus on Jamie and Claire to more focus on the Fraser Clan. I’m good with this change, although I am hoping that if Brianna and Roger reunite, I’ll be able to care more about Roger. I’m curious about what other viewers think about this change. I thought it was a really solid episode. It will be a long time before I forget the closing image. What did you think of the episode? What do you think of the change in the paradigm of the show?